This project is easy, fun, fast and cute masha'Allah! The idea is a modified craft project from the book, Crafts to make in the Fall by Kathy Ross. While most of the things in the book are not appropriate for Muslim children (i.e. non-Islamic holidays, etc. ), some of the ideas are easily modified to become Islamic crafts. 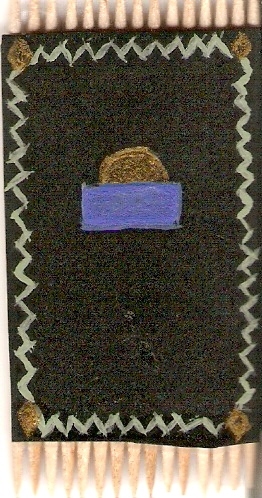 This one for example, was a craft for making a flag. Well, the dimensions were similar to...a prayer rug! So I just used the same materials and made a prayer rug instead. Now, I'm no artist so don't laugh to long and hard at my example (below - and for some reason mine looks way better on the fridge than it does in this picture!...lol) but your little ones will undoubtedly make one worthy of being on the fridge insha'Allah. If your child wants the fringe of the prayer rug to have a colour, use a permanent marker to colour the sticks (toothpicks or Popsicle sticks) insha'Allah. In advance, have your child(ren) cut out a rectangle of construction paper that is the same size - width wise - of the toothpicks/Popsicle sticks when glued together (I arranged all of the toothpicks first without gluing them and just did an approximate measure of the width). Have the child draw/paint/colour the design they want on their prayer rug insha'Allah. Put the toothpicks (or Popsicle sticks) on the plastic lid. Cover them with a layer of glue to hold them together but don't flood the toothpicks if you colour them because this will cause the marker to run. When all toothpicks/Popsicle sticks are arranged properly gently put the construction paper on top of the toothpicks/Popsicle sticks insha'Allah. Press gently. 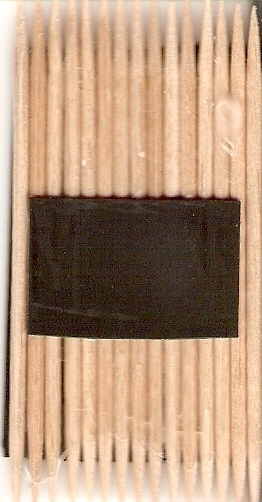 When the toothpicks/Popsicle sticks dry (took about 15-20 minutes), glue a small rectangle of sticky back magnet on the back of the prayer rug. Stick it on the fridge insha'Allah! As Salaamu Alaykum Wa Rahamahtuallahi Wa Barakatuh, OOOOH Masha Allah!!! I am going to have the kids do this during Ramadan insha Allah. I have been looking for ideas and this is a good one!!! Love it!! I'm always looking for new crafts with an Islamic twist. I just wanted to say that this is a great idea! I made it with my 3.5 year old and she loved it. Jazak Allah Khair. Masha'Allah, so happy your little girl enjoyed it! I'd love to see a picture of it insha'Allah. If you could send it to me (a picture) I'll add it to this post insha'Allah!